Dinosaur Comics - August 26th, 2015 - awesome fun times! T-REX: Wow. WOW. That's the worst relationship advice I've ever heard, and I once took relationship advice from Burger King! UTAHRAPTOR: What was the advice? 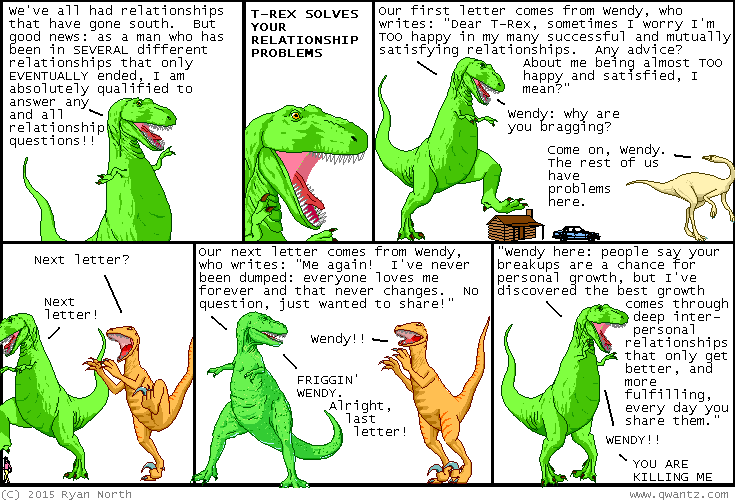 T-REX: He told me to "have it your way". Anyway at that point I entirely rewrote the comic for reasons that I hope are clear?? One year ago today: it was just lucky for david that people's minds were printed in English. phew, am i right? ?